Under the floor, the rusty base plate/idle wheel that I will need to replace. 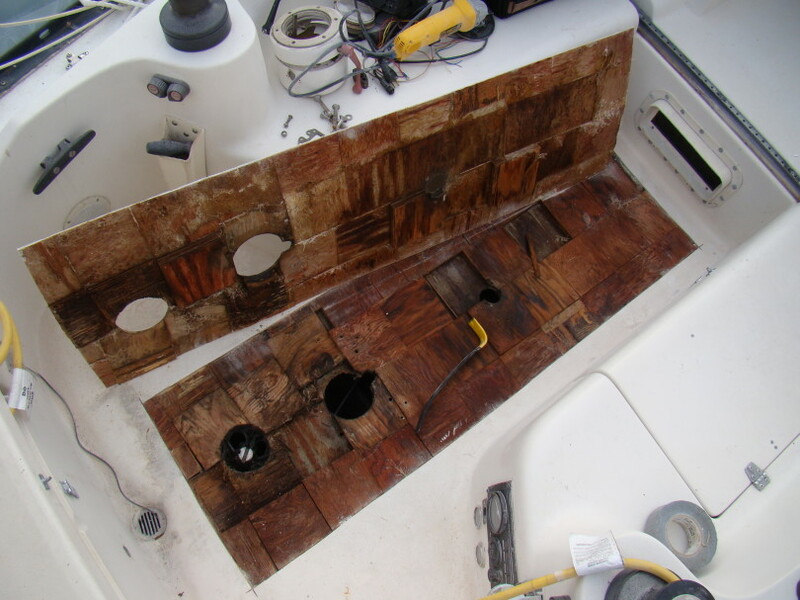 Unfortunately, while the boat survey did mention the moisture problem, I hadn’t really realized the extent of the problem until I had removed the wooden grate on the floor and felt the floor sag directly under my feet. Ok, so what do I do about it? This will be a very complicated and tiring job but it has to be done. 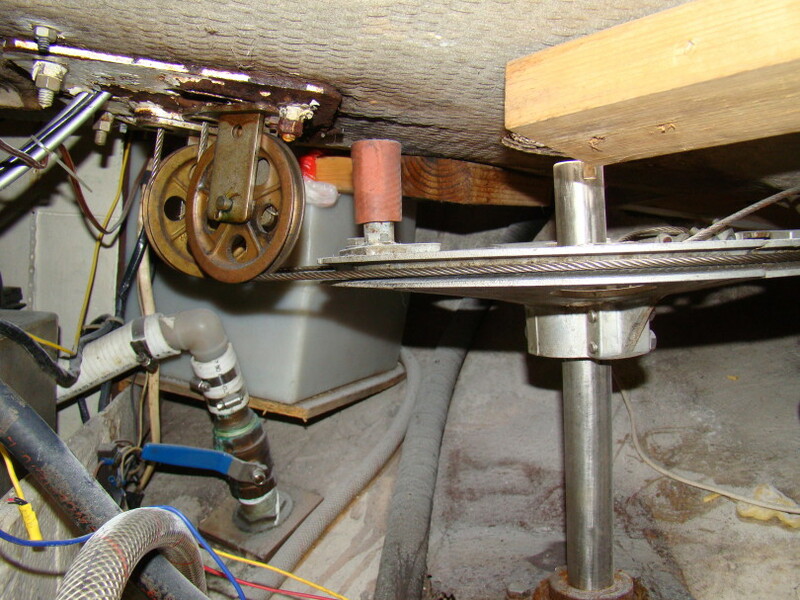 Not only is the water soaking the floor, but it is dripping down onto my gas tank below the cockpit, onto the muffler and down into the bilge. 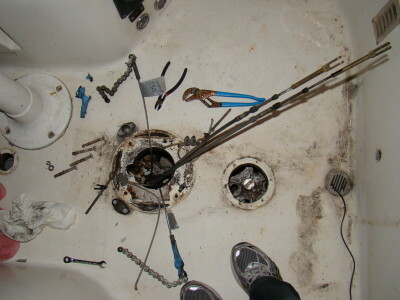 Disassemble and remove all fittings in the floor. ie. the cockpit pedestal/steering wheel, drain and diesel fill cap. And finally re-attach the steering pedestal and fittings. I’m already exhausted just thinking about it. 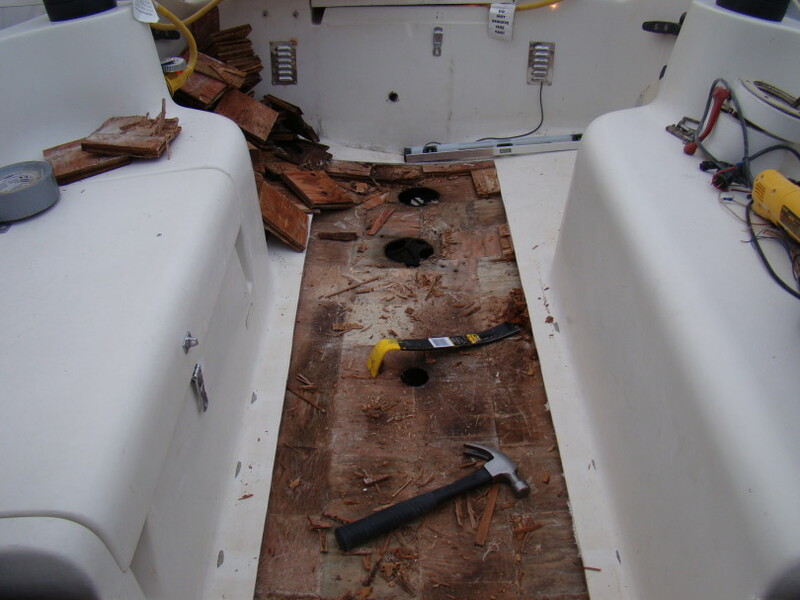 Clean the area and begin removing the easily removable parts. Removing the diesel fill cap. 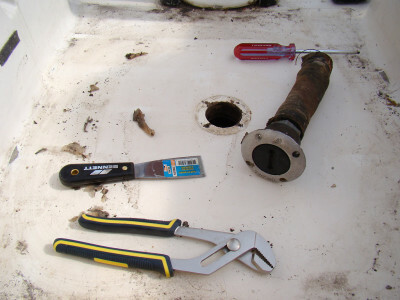 The Edson pedestal steering post removed. Removing the pedestal was a bit of a challenge. The mess of wires, throttle and transmission links were a little intimidating at first. I had two instruments on my pedestal that just didn’t work so I spent a fair bit of time tracing the wires back to see where they went. I am prepared for the massive amount of dust this grinder will create. Once the pedestal was removed, wiring pulled out, and the surface prepared, I used the angle grinder with a cutting wheel attachment to cut through the top skin of the floor. 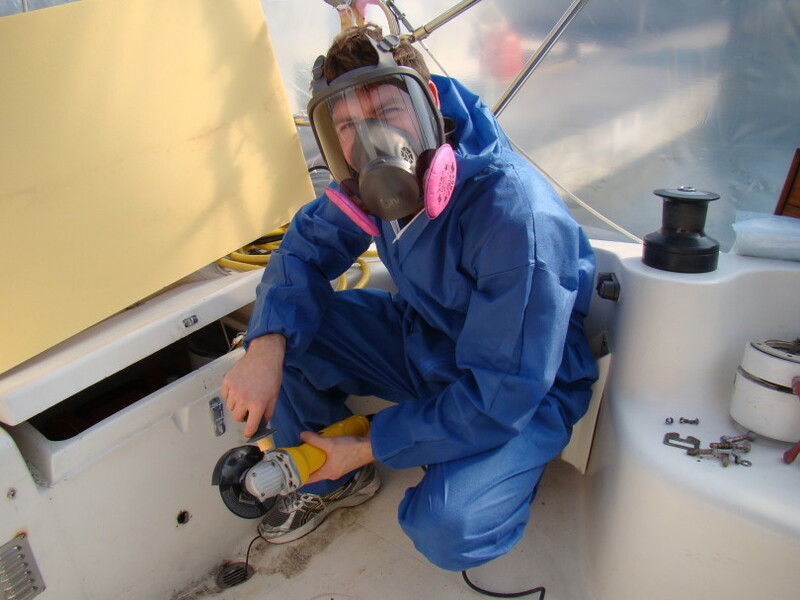 I made sure to wear a suitable dust mask and coveralls to protect myself from the dust. You can also see in this photo the new foam core that I will be using to replace the soggy wood with. The foam core was the highest density the local marine supply shop had available. I plan to use FRP from McMaster Carr for the areas directly under the pedestal and diesel fill cap. Using a pry bar to peel the top skin off. Once a cut was made, I used a pry bar to peel the top skin up and away. It took a bit of muscle and patience to get the wood core to separate from the top skin. In this case, the worse the delamination, the easier it was to peel apart. And there it is! The very soggy core. Its interesting that the core isn’t balsa like I thought it would be. It seems to be just standard plywood in 5″ squares. I am not sure why they are such small segments but it did make it easier to pry out. A few areas took a bit of work to pull out from the edge of the cut. I am still undecided if I should extend the cut up the curved floor and get the last few wet blocks out. I am surprised as the wood, while fully saturated with water, is still in somewhat decent shape. I have heard from a neighbor that had done the same repair last year had found his core had been reduced to brown muddy sludge. I can see that drilling multiple holes through the top of the fiberglass skin would not have let the core dry, even if I had the time to leave it for a year. 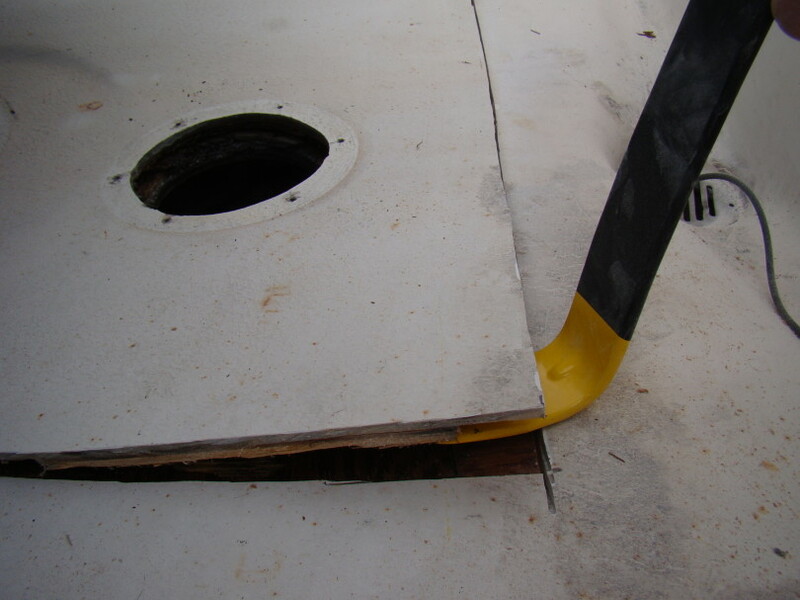 It would still also not solve the sagging floor issue, and delamination issue. 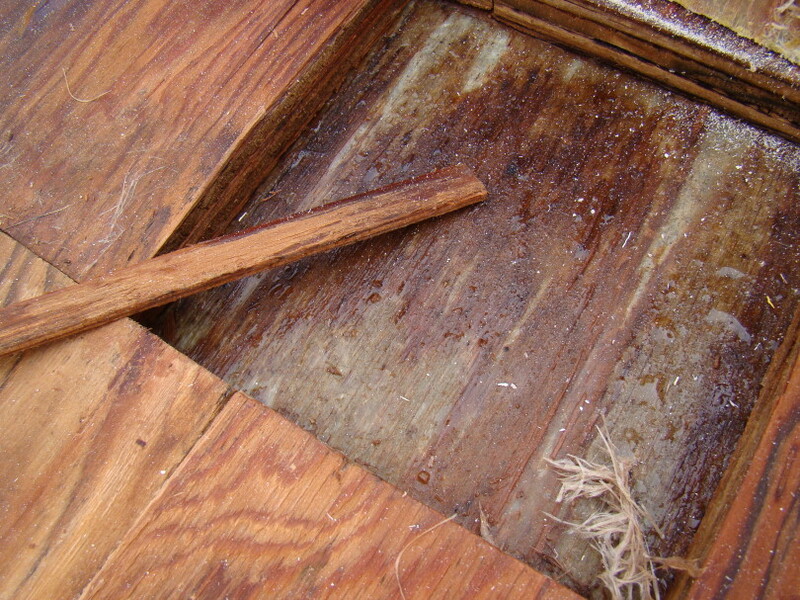 I spent a good afternoon cleaning up the area by removing the soggy core and sanding the exposed fiberglass skin. I was originally planning on saving the top skin and placing it back in place once the repair was complete but due to the large bend in the glass, I am now starting to lean towards laying brand new glass down. I am also flip flopping between using Epoxy Resin and Polyester Resin. Epoxy is definitely the way to go for strength but Polyester Resin is significantly cheaper. I spent countless evenings reading up on the subject in forums and flip flopping back and forth on the decision. I think I will have to deal with the extra cost and go with Epoxy. 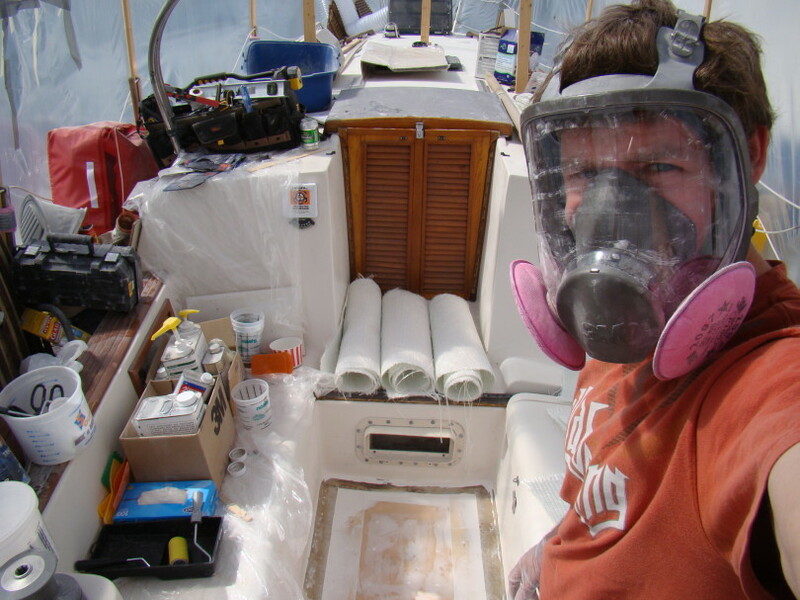 I live on this boat so the strong Polyester smell while it cures may be the deciding factor.